Name: Zagreus; initially a split identity of the Eighth Doctor before going on to possess a woman known as Perfection. Time of Origin: Technically a self-creating myth; The Doctor assumed the name from an ancient Gallifreyian nursery rhyme, planted back in the past of the universe to set up a complex plan to destroy the universe, but the persona of Zagreus manifested in the era of The Doctor’s eighth incarnation. 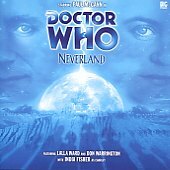 Appearances: "Neverland", "Zagreus" and "The Next Life"
Doctor: Shared a body with the Eighth Doctor before manifesting as a separate entity; confronted holograms based on the Fifth Doctor, Sixth Doctor and Seventh Doctor, as well as a vocal interface based on the Third Doctor. Companions: Charley Pollard, 2nd Romana, Leela, K9, C’Rizz; the manifestation of Zagreus that controlled the TARDIS interacted with holographic recreations based on Nyssa, Turlough, Erimem, Peri, Evelyn Smythe, Melanie Bush, Ace and Bernice Summerfield. According to further myths, countless civilisations across the universe came to believe in a tale of an ancient god who confronted an ancient demon in perpetual combat. 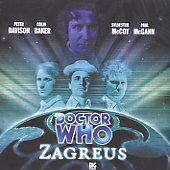 A small group of Time Lords came to believe that the myth was a truthful account of a confrontation between Rassilon and Zagreus, Rassilon travelling into anti-time to keep Zagreus contained. Although the anti-time universe did have its own 'native' inhabitants who were apparently fairly peaceful, anti-time itself was a fundamentally destructive force, as dangerous to reality as anti-matter was to matter, contact with even a small portion of anti-time being completely hostile to existence itself. Determined to escape their universe, the people of the anti-time universe set an elaborate trap, after the Eighth Doctor unwittingly created a temporal rift when he saved his companion Charley Pollard from her destined death on the R-101 ("Storm Warning"). As The Doctor's actions changed history, Charley's continued life created a rift in the universe that would allow the forces of anti-time to break out into our universe, tracking whever The Doctor went with Charley and progressing from there. Eventually, the Time Lords captured The Doctor and Charley to investigate the problem, but although Romana was willing to try and find another solution beyond killing Charley, they were forced to use Charley to create the rift at their end so that they could travel to the anti-time universe and try and resolve the rift at the other end, travelling through Charley via a time station. Meeting the forces of the anti-people, represented by the mysterious Sentris - an anti-person who had taken Charley's form - the anti-time natives claimed that Rassilon was contained within a time cabinet that should be taken back to Gallifrey, but The Doctor and Romana realised that the cabinet and the myth were all faked; the cabinet's real purpose was as a container of a massive surge of anti-time, and the natives of the anti-time universe they had been talking with were actually those who had been punished by the Time Lords' Celestial Intervention Agency for various perceived 'crimes', the Agency literally erasing these criminals from history itself and the 'Never-People' manifesting in the anti-time universe (Sentris was actually a former Agency director who had erased herself out of guilt when she realised how many she had punished in that manner). With Sentris having linked the cabinet to the time station's self-destruct system, she intended to detonate the station once it materialised on Gallifrey, triggering a massive surge of anti-time that would completely destroy the Web of Time itself. Refusing to give into the option of simply shooting Charley to remove the breach, The Doctor instead took a more desperate gambit by materialising his own TARDIS around the time station, containing the explosion with his ship. 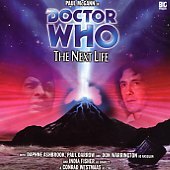 The destruction of the time station destroyed the Never-people and saved the universe while making Charley's survival on the R101 part of history, as her survival drove The Doctor to save it. Unfortunately, while the obvious destructive side-effects of the anti-time explosion were prevented, the detonation in the TARDIS had a more personally terrifying consequence. As a result of the anti-time explosion, The Doctor and the TARDIS were each contaminated with the essence of anti-time itself, causing a psychological fracture as the corrupted Doctor chose to adopt the name Zagreus as his own. While searching his ship for Charley - who had been returned to the ship after the destruction of the time station - The Doctor/Zagreus came in contact with a fragment of zero matter contained at the heart of the TARDIS, which exerted a stabilising mental influence on The Doctor/Zagreus so that the two personalities could converse rather than one forcing the other down. Although Zagreus had trouble accessing The Doctor's full memories, such as initially having trouble even remembering what the TARDIS was called, he was still a dangerous force, making it clear that he would utilise his unlimited power and potential to destroy everything if he was set free. As The Doctor struggled with Zagreus, Charley found herself experiencing projections of various points in history when the anti-time universe had intruded on the prime universe, accompanied by a hologram of the TARDIS manifested in the form of Brigadier Lethbridge-Stewart (chosen as a person who was important to The Doctor and Charley) and the historical projections using the images of past Doctors and their companions to represent key people in these events. As Charley witnessed these projections, which included the revelation that Rassilon had trapped a race powerful enough to defeat the Time Lords in a divergent timeline locked in a time loop, The Doctor realised that the TARDIS had also experienced the same mental fracture as himself between its usual persona and Zagreus. When Rassilon's personality manifested from within the Matrix to contact the corrupted TARDIS, the ship agreed to Rassilon's offer to purge it of the anti-time infection in exchange for The Doctor. As Rassilon and the Brigadier avatar expelled Charley from the TARDIS, they took The Doctor to Rassilon's foundry, Rassilon having already tricked Romana and Leela into providing him with access to the foundry by possessing Leela and luring Romana into the Matrix to steal her presidential access codes. However, the TARDIS's good side remained active, providing Charley with assistance in the form of holographic recreations of three key figures from the simulations Charley had witnessed, the holograms manifesting in the form of the Fifth Doctor, Sixth Doctor and Seventh Doctor, each retaining access to at least aspects of The Doctor's knowledge. While Romana, Leela and Charley kept The Brigadier/TARDIS occupied, the 'Doctors' tracked down The Doctor, now with his sanity shattered after Rassilon melted down the TARDIS's shell to acquire the TARDIS metals, contaminated with anti-time, so that Zagreus could forge a dagger. It appeared that Zagreus had won, but the 'Doctors' put together what they'd learned, and realised that the Divergents were the race that should have evolved to surpass the Time Lords. Until now Rassilon had only been able to keep them trapped in a time-looped pocket universe, but when The Doctor chose of his own free will to give himself up to anti-Time, he became the very weapon which Rassilon needed. Once all trace of The Doctor's former self was gone, Rassilon intended to send Zagreus into the Divergent timeline to destroy every last one of the Divergents with his anti-Time blade. The Doctor tried to resist, refusing to kill for Rassilon as the projections helped him to re-affirm his identity as The Doctor, but Rassilon took the blade from him and cut down the three holographic Doctors, crippling The Doctor's resolve once again and leaving only Charley to save the day by stabbing The Doctor before Zagreus could retake control. Confronted by his past selves in his mind, The Doctor realised that, in his despair, he'd actually wanted to die for a moment, and thus, regeneration had been averted. However, determined to stop Rassilon using the power of anti-time, The Doctors surrendered to the Zagreus infection so that the Zagreus persona could use anti-time to cancel the moment of their death, taking a desperate gamble that paid off; like all god-powerful beings, Zagreus would not be Rassilon's puppet. He cast Rassilon into the Divergent's universe before collapsing himself, leaving the companions powerless to take action to help him. However, the TARDIS was reconstituted into its true self after the companions dropped the avatar into the melting pool that had been used to destroy the TARDIS shell, allowing the now-good TARDIS avatar to provide a 'cure' for the psychological effects of the anti-time infection with a sample of Zero Matter, restoring The Doctor to himself. Believing that the essence of Zagreus still existed within him, The Doctor decided to ensure the safety of the wider universe by travelling into the anti-time reality himself, concluding that remaining in the anti-time universe would prevent him damaging his universe and also help him remain in control. However, it was only after travelling through the anti-time universe for a while (time naturally being hard to define in a universe of anti-time) that The Doctor would learn that actually the Zagreus and anti-time energies had been filtered out of his body once he entered the anti-time universe, allowing Zagreus to manifest as a completely independent entity, albeit as a discorporate spirit only able to possess the dead. The Zagreus entity eventually possessed the body of Perfection, the 'perfect woman' and wife of Daqar Keep, the most powerful man in the Divergent universe. However, Keep was actually the result of an experiment in accelerated evolution that The Doctor and Charley had become trapped in when arriving in the anti-time universe; essentially, Keep was what The Doctor and Charley would have evolved into if the experiment had run its course. Keep and Perfection were each part of the Divergents' attempt to introduce the concepts of evolution and change to the anti-time universe that was trapped in a perpetual loop, Keep able to absorb other life-forms into himself while Perfection was their attempt to create someone who could introduce the concept of time to this universe. However, by the time Keep had emerged into the universe, the Divergents had already decayed from age, allowing Keep to take their power and hunt Rassilon. However, as Keep asserted his power in the universe, Rassilon was eventually able to take control of the blue planet that had been the Divergents' headquarters, even if he was unable to return to his universe as the key to the necessary equipment had been taken by the religious order known as the Foundation. Keep had claimed Perfection as the true perfect woman in order to create his own dynasty in the anti-time universe, but she had eventually killed herself in order to escape his brutality, only for Perfection's corpse to be subsequently possessed by Zagreus's essence. With 'her' new body as a disguise, Perfection-as-Zagreus tried to trick The Doctor into taking her into the main universe by working with him in the hunt for the Foundry. During this time, Zagreus enjoyed a flirtatious relationship with The Doctor, even proposing at one point to repopulate the Divergent universe with their children as the universe approached the end of its current cycle, The Doctor acting as the Adam to her Eve. When she mentioned this legend, which could only be known to someone from his universe of origin, The Doctor saw through Perfection's deception and recognised Zagreus, but she had already incapacitated Keep and hypnotised Charley by the time he took action. She attempted to escape into this universe in the TARDIS but it was really Keep adopting its form, causing her to become trapped in his body for long enough to allow The Doctor and his companions to leave. Now stuck in the Divergent Universe with no hope of escape, Zagreus accepted Keep's proposal that rather than fight they should renew their wedding vows and seize control of their universe, both agreeing that it would be very 'diverting'.